Alpha-TIF (VP16) from Herpes Simplex virus is an essential tegument protein involved in the transcriptional activation of viral immediate early (IE) promoters (alpha genes) during the lytic phase of viral infection. VP16 associates with cellular transcription factors to enhance transcription rates, including the general transcription factor TFIIB and the transcriptional coactivator PC4. The N-terminal residues of VP16 confer specificity for the IE genes, while the C-terminal residues are responsible for transcriptional activation. Within the C-terminal region are two activation regions that can independently and cooperatively activate transcription [(PUBMED:15654739)]. VP16 forms a transcriptional regulatory complex with two cellular proteins, the POU-domain transcription factor Oct-1 and the cell-proliferation factor HCF-1 [(PUBMED:12826401)]. 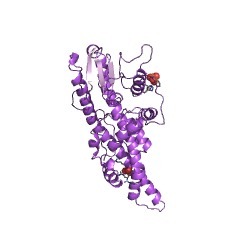 VP16 is an alpha/beta protein with an unusual fold. Other transcription factors may have a similar topology. There are 60 Alpha_TIF domains in 60 proteins in SMART's nrdb database. Taxonomic distribution of proteins containing Alpha_TIF domain. This tree includes only several representative species. The complete taxonomic breakdown of all proteins with Alpha_TIF domain is also avaliable. Click on the protein counts, or double click on taxonomic names to display all proteins containing Alpha_TIF domain in the selected taxonomic class. Structural properties of the promiscuous VP16 activation domain. Herpes simplex virion protein 16 (VP16) contains two strong activation regions that can independently and cooperatively activate transcription in vivo. We have identified the regions and residues involved in the interaction with the human transcriptional coactivator positive cofactor 4 (PC4) and the general transcription factor TFIIB. NMR and biochemical experiments revealed that both VP16 activation regions are required for the interaction and undergo a conformational transition from random coil to alpha-helix upon binding to its target PC4. The interaction is strongly electrostatically driven and the binding to PC4 is enhanced by the presence of its amino-terminal domain. We propose models for binding of VP16 to the core domains of PC4 and TFIIB that are based on two independent docking approaches using NMR chemical shift changes observed in titration experiments. The models are consistent with results from site-directed mutagenesis and provide an explanation for the contribution of both acidic and hydrophobic residues for transcriptional activation by VP16. Both intrinsically unstructured activation domains are attracted to their interaction partner by electrostatic interactions, and adopt an alpha-helical conformation around the important hydrophobic residues. The models showed multiple distinct binding surfaces upon interaction with various partners, providing an explanation for the promiscuous properties, cooperativity, and the high activity of this activation domain. The herpes simplex virus VP16-induced complex: the makings of a regulatory switch. Nucleotide and deduced amino acid sequences of the gene encoding virion protein 16 of herpes simplex virus type 2. A virion protein (VP16) of herpes simplex virus (HSV) activates transcription of viral immediate-early genes. We have determined the nucleotide sequence of the virion activator gene from HSV-2, which we term VP16-2. Comparison of the deduced amino acid sequences of the HSV-1 and HSV-2 homologs shows that the VP16-2 gene product retains features determined to be important for transcriptional activation by VP16.